Twelve-year-old Mallie's prospects are grim. In her mining town, Coal Top, boys leave school at 12 to work in the mines, and girls leave to work as servants for the rich people. Mallie can't stomach the idea of that kind of life, but what choice does she have? Especially when her family is counting on her wages to survive. All that changes when Mallie is recruited for a da Twelve-year-old Mallie's prospects are grim. In her mining town, Coal Top, boys leave school at 12 to work in the mines, and girls leave to work as servants for the rich people. Mallie can't stomach the idea of that kind of life, but what choice does she have? Especially when her family is counting on her wages to survive. All that changes when Mallie is recruited for a dangerous competition in which daring (and ideally, orphaned children) train flying horses to battle the monsters that lurk beneath Coal Top. If she wins, she'll earn a fortune for her struggling family. If she fails . . . her family will have one less mouth to feed. To ask other readers questions about Over the Moon, please sign up. Over the Moon by Natalie Lloyd, 304 pages. Scholastic Press, MARCH 2019. $17. Mallie lives a dreary, desperate life in tiny town on Coal Top Mountain. An insidious dust has covered the skies for almost a generation, blocking out the sky, the sun, and stars. Mallie slaves each day in the valley below for a meager salary, but one day she finds an ad looking for brave boys willing to risk their lives for an adventure. This may be j Over the Moon by Natalie Lloyd, 304 pages. Scholastic Press, MARCH 2019. $17. Mallie lives a dreary, desperate life in tiny town on Coal Top Mountain. An insidious dust has covered the skies for almost a generation, blocking out the sky, the sun, and stars. Mallie slaves each day in the valley below for a meager salary, but one day she finds an ad looking for brave boys willing to risk their lives for an adventure. This may be just what Mallie needs to quickly earn the money she needs to save her little brother from the mine. What she finds when she disguises herself and applies is beyond her wildest dreams. And it may just be the answer to returning sunshine and magic to her town. Lloyd is so good at inserting magical yearnings into her writing! You can see from the cover what I mean, but it’s even better than you think. Fans of A Snicker of Magic will dive on in. braid beauty for all to see. An absolutely beautiful book that is full of layers that are begging to be discussed. Lloyd has outdone herself with this one - full of gorgeous language and set in a haunting, yet beautiful setting. I have a feeling this one will be well loved amongst readers! Why I'm interested in this book: Recommended on Twitter by Michelle Knott. I always start a Natalie Lloyd book not knowing what to expect but being certain it's going to be magical, fun, and full of positive messages. This is probably my favorite of hers as the whole concept of flying horses and weaving stars is quite romantic. I like Mallie's fierce and yet gentle way of protecting her family and searching for truth. I think young readers will enjoy this book and learn important lessons from the characters and their situations. Not only is this one of my favorite authors, but I did not want to put this book down once I started reading it! I read it on a plane ride home, got home late, and then stayed up even later to finish reading! Natalie Lloyd has such a wonderful way of connecting the reader to the characters. You can just feel her smiling personality come out in her creations! I got an early copy of this book while attending a reading conference for educators. I will always be a fan of Natalie Lloyd and this one did not disappoint!! This is such a powerful story about the need to push through the dark times! I don’t know a single person that will not be able to relate to this story! I have been a fan of Natalie Lloyd's since I first picked up her book, A Snicker of Magic, several years ago. Natalie is one of the most talented children's fantasy writers I have read. Her ability to construct stories and worlds that I could never have dreamed about reigns supreme among other fantasy books. In her new book, Over the Moon, Natalie has once again created a fantasy world that will mesmerize her readers. Set in the town of Coal Top, you meet a young girl named Mallie. Mallie and her family are living in a world of little hope. Mallie's father can no longer speak and is blind due to a tracking mining accident. Mallie's little brother is being sought after now by the Guardians in order to replace their father in the mines. In desperate hopes to pay off her family's debt, and save her little brother from a life in the mines, Mallie takes it upon herself to enter a dangerous contest thrown by Mortimer Good in hopes of winning the prize money and ending her family’s problems forever. Through each challenge, Mallie brings herself closer to paying off her family’s debts and saving her brother from a life of misery. But as she gets closer to the dark truth behind the Guardians that the real realities of their leader. Lloyd’s third novel for upper elementary students is a departure from her previous two magical realism titles; this one is firmly set in fantasy. Born into a Coal Top Mountain family in the times of the Dust, Mallie “Over the Moon” Ramble is a tween-age girl who must support her family by working as a servant girl for a rich family in the valley. Also, she must work off the debt her father incurred when he “damaged equipment” in the coal mine (he was blinded as a result of the dust while working in the mines). When her family must cough up an additional five thousand feathergills to pay off the oppressive Guardians, Mallie jumps at the chance to enter a dangerous competition learning how to train flying winged horses called Starbirds and carry out dangerous missions for rich rewards. This story has lots of heart and wears it on its sleeve. Mallie is a spunky heroine, willing to risk everything to protect her family and friends. She grows to trust not only others, but also herself. Peripheral characters add to the action and drama, but are not well developed. Only the leader of the Guardians, Mortimer Good is named and is fleshed out as a stereotype villain. A fun escape full of heart and kindness. 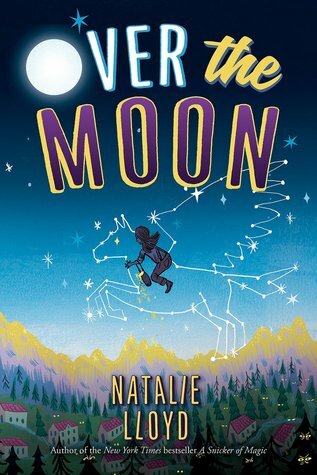 @kidlitexchange #partner: Over The Moon by @natabitz and @scholasticinc. Available NOW! I had never read a book by Natalie Lloyd until now. If they’re always this beautiful, I want to read them all. Over the Moon brings us a dystopian fantasy world where the starlight has been blocked for years by a cloud of thick, choking, mind-altering dust. It is the story of what happens when people stop questioning authority. When people accept absolute reality and never ask “what if?” It’s a story of what h @kidlitexchange #partner: Over The Moon by @natabitz and @scholasticinc. Available NOW! Over the Moon brings us a dystopian fantasy world where the starlight has been blocked for years by a cloud of thick, choking, mind-altering dust. It is the story of what happens when people stop questioning authority. When people accept absolute reality and never ask “what if?” It’s a story of what happens to the good in the world when there is so much evil. And above all, it is the story of a little girl who desperately wants to save her brother. This book is lovely. Lovely. Every sentence explodes with life and light and beauty. Its power is in its simple weaving together of words into imagery. I love it. And to think I never would have picked it up without the influence of #kidlitexchange. Don’t be dumb like I am. Read this book! And thank you, @natabitz, for writing it. For quite nearly inventing middle-grade dystopia, for making it so beautiful, and for giving us a thrill of hope. @kidlitexchange #partner Thank you to the #kidlitexchange network, publisher @scholasticinc and author @natabitz for the review copy of this book. Any opinions are my own. Twelve-year-old Mallie lives in Coal Top. Boys work in the mines, and girls are servants to the rich townspeople. Life in Coal Top is dictated by the Dust. There is no sunlight, there are no stars, there is only the choking Dust. Hope left when the stars disappeared, and local people could no longer @kidlitexchange #partner Thank you to the #kidlitexchange network, publisher @scholasticinc and author @natabitz for the review copy of this book. Any opinions are my own. There is no sunlight, there are no stars, there is only the choking Dust. Hope left when the stars disappeared, and local people could no longer weave starlight into cloth. When Mallie gets selected to complete missions for Mortimer Good, the Head Guardian, she has the opportunity to protect her brother from the mines, and pull her family out of debt. This dangerous mission will lead Mallie on a quest for truth and starlight— on the back of a winged horse. Love, love, LOVE this book. I love Natalie Lloyd's heartfelt, magical writing, so when I say the chance to get her new book through Scholastic book orders early, I jumped at the chance. My first copy came with about 6 pages misprinted, but I could not put the book down anyway. I got a replacement copy (thank you Scholastic) and ended up rereading the entire book because I couldn't stand feeling like I had missed even a part of the story. I have a towering TBR pile and rarely reread books, but th Love, love, LOVE this book. I love Natalie Lloyd's heartfelt, magical writing, so when I say the chance to get her new book through Scholastic book orders early, I jumped at the chance. My first copy came with about 6 pages misprinted, but I could not put the book down anyway. I got a replacement copy (thank you Scholastic) and ended up rereading the entire book because I couldn't stand feeling like I had missed even a part of the story. I have a towering TBR pile and rarely reread books, but this book is just that good. I would reread it again right now. I bought extra copies to offer this book in literature circles this year. A beautiful tale about the triumph of the human spirit over tyranny. And, yes, there are flying horses!!! Natalie Lloyd is one of my favorite authors, because of her ability to write about spunky, flawed heroines. Mallie struggles with her negative impulses yet desires to do her best to help support her family in a dusty world where the stars have disappeared. Then she meets Leo and they fly over the moon together. Filled with heart and a snicker of magic (see what I did there?). Thank you to Sc A beautiful tale about the triumph of the human spirit over tyranny. And, yes, there are flying horses!!! Natalie Lloyd is one of my favorite authors, because of her ability to write about spunky, flawed heroines. Mallie struggles with her negative impulses yet desires to do her best to help support her family in a dusty world where the stars have disappeared. Then she meets Leo and they fly over the moon together. Filled with heart and a snicker of magic (see what I did there?). I've loved all of Natalie Lloyd's books. Her writing style is beautifully lyrical, with sweet stories full of hope and family. This one was a powerful story of living a better story than the one we're given, of pushing through fear and sorrow and anger until you find peace beyond them. It's a story about bravely holding onto hope, even when everyone tells you there's nothing to hope for. And it's also a super fun adventure! I loved it. ARC Copy...even though this was a fantasy it felt like it contain strong flavors/tones of the rocky Appalachians mountains or Rocky Mountains social culture/geography feel only with magical realism added in. I like the girl is willing to go for it despite what others say and the concept of stories...there are stories that contain truths and help people, while there are stories that lie and control people. The "Truth" and "Lies" elements very much factor into the narrative. I liked this read. Interesting story with a strong main character, lots of magic, villains, and flying horses. Mallie has learned that the boys work in the mines, the girls do domestic work. She want something more, different. After answering an ad, she starts to ask questions and see things in a different light. After a few risky moves, Mallie and her friend Adam find the truth and set the town free. Natalie Lloyd does it again. I read The Key to Extraordinary and then decided to follow it up with this one, her newest book. It's a bit darker and more adult than Key, but no less interesting or worth reading. Natalie Lloyd writes interesting characters and sticks them into always-moving plots. It's fun, it's entertaining, it's more than a little inspiring. Worth your while! Mallie is an admirable heroine. This book is missing something: the pacing is a little strange, the explanations a little too easy, or the wrap up a little too neat. BUT, it is a great book for kids to read. It encourages standing up against those who work to press you down. "We are the stories we are given." What an important message. Timely and timeless. 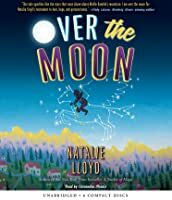 Like all of Natalie Lloyd’s books, Over the Moon triumphs with love and hope, strength and friendship, and just a snicker of magic. This new heartprint book is one I’ll share with readers who need to find their own voices, to find courage, to dream, and to question the story they’ve been given to live their better than best story. 3.5 I am a huge fan of a Snicker of Magic & The Key to Extraordinary. Over the Moon has a different feel. The language wasn’t as lyrical and the storyline wasn’t as complex but I still enjoyed it. Plenty of girl power and positive messages about thinking for yourself & overcoming fear were definitely the strengths of this story! With a bit more fantasy than Natalie Lloyd’s previous books, Over The Moon surprised me but drew me in as always. As Mallie fights back against the Dust, there are expected adventures and unexpected twists that leave you wondering how she could possibly save her family and her town. You’ll cheer on Mallie, a likeable imperfect fighter, and you’ll wish for a Starbird to take you into her world. This is another great story from Natalie Lloyd. Her imagination must be an amazing place! Read my review at Bookish Adventures. This is one not to miss! Middle-grade readers will be pulled into Mallie's adventure as she puts herself in great danger to save her family. Friendship, loyalty, and poverty are all themes that are begging to be discussed in this beautifully crafted book. This book, and all of Natalie Lloyd’s writing, is a wonderwow. The world Natalie Lloyd creates is dreary but lit by dreams and a girl whose grit and strength belie her physical handicap of missing one of her forearms. Magical and inspiring.